Very few people enjoy the actual process of mowing their lawn. That is why so many people use the lawn maintenance services of the team at Mr. Tree and Lawn Service. With experience in residential as well as commercial lawn maintenance we consider ourselves the go to professional lawn care professionals in the Gainesville area. Before you start mowing, take a few minutes to pick up sticks, children’s toys, dog toys, etc. from the yard. Doing this will make the mowing so much faster because you don’t have to stop and pick anything up as you mow. Mow along the fence line (if you have a fence) and any other obstacles, such as large trees, first. It is much easier to mow and turn around this way if you have already cut close to objects. Otherwise, you may end up leaving a patch of grass here and there. If you mow every week, it will be much easier to get the task done in a timely fashion. If you wait for two or three weeks, you create much more work for yourself. Mowing earlier or later in the day prevents you from having to do this task in the blazing hot sun. Pick a time when the weather is going to make the job easier for you. If you yard is lined with flower beds, create a natural edge that you can mow right up to. This will eliminate the need to drag out the weed eater and go along all of the flower bed edges. To create a natural edge, simply dig a shallow trench along the flower bed and fill it in with mulch. You can mow right up to this edge without damaging any plants. 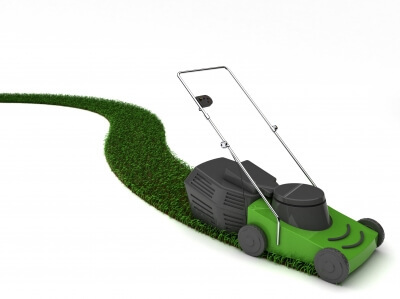 Keep your lawn mower blades sharp so that the mower cuts evenly and effectively. It is good to sharpen the blades in fall or spring. If you raise your mower height and leave the grass slightly longer, your lawn will be healthier, it won’t brown as quickly in the dry weather, and you will be able to get a bit of extra time between mowings. With these tips you’ll be on your way to a quick and easy lawn mowing job in no time. If it is still taking too long however just give us a call at 352-682-4444 or use the convenient “Contact” form on our website to talk to us about your lawn care needs in the Gainesville area.